Knowing what options you have to take advantage of at your binary options brokerage is always important. Many traders treat their platform as a place to deposit, place trades and withdraw funds, but it’s come to my attention that many brokers offer a lot more to their clients. The Binary Cent broker offers a binary options contest every single week that allows traders to earn from a prize pool of $20,000. While to the broker the reason for putting on these contests is to incentivize clients to trade more, there is no reason why traders shouldn’t take advantage of this. The first place prize is $500, so it’s certainly worth your time to place a few extra trades and see if you can climb the leaderboard. The most important rule to the $20,000 contest is determining a winner of the weekly tournament. Much to my surprise, the contest determines the winner based on overall trades placed. So, it doesn’t matter if you win or lose, and it doesn’t matter how much you invest, it only matters how frequently you trade. Obviously, you will have to win a significant amount of trades in order to continue trading at a high volume, but you could also trade more frequently if you are trading a smaller investment per trade. In order to qualify for the contest, all you have to do is be alive account owner with a deposit of more than $250. Every client of Binary Cent is automatically registered for the tournament, which means you don’t have to sign up for the contest on your own. If you happen to trade frequently enough to win a prize, you will be notified via email, and you can always check your current rank in the leaderboard. The Binary Cent “contest starts every Sunday at 21.00 GMT and ends Sunday at 20.30 GMT.” So, as soon as Sunday evening hits, you can start viewing the active contest leaderboard to see how many trades have been placed, and who is currently in the lead. 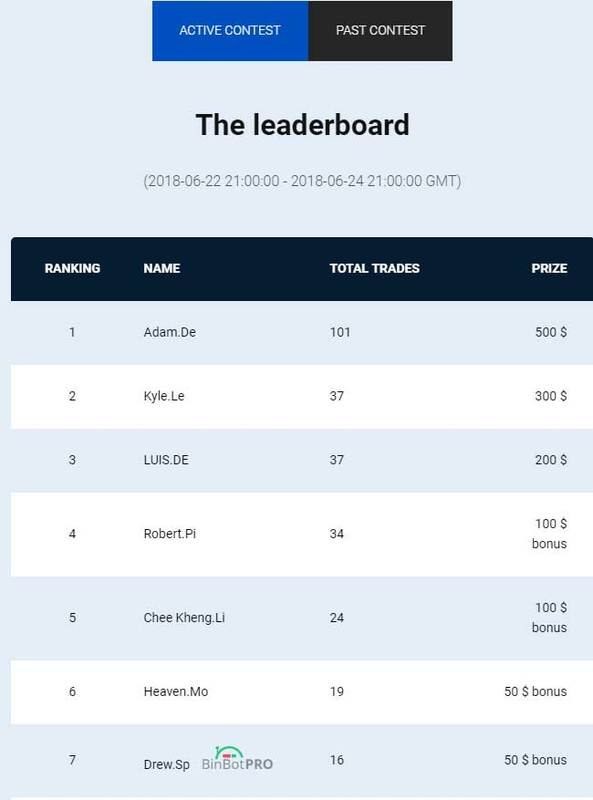 The active contest leaderboard shows the top 10 traders, and what prizes they are in line to win based on their current position. It’s always a good idea to check the leaderboard to see if you are close, so that you can adjust your trading habits, and potentially place more trades if you feel you are close enough to win a prize. The past contest leaderboard shows the top 20 traders, and how many trades they’ve made in the past week to qualify themselves for prizes. This is a good way to measure up your competition, and see if you have the potential to find your way up the leaderboard. In the current example, we can see that the top 5 traders all had over 20,000 trades placed, which is an extremely high number, and would definitely rule me out of the competition and fast order. In a busy week, I probably only place anywhere between 100 to 300 trades, which would put me outside of the top 20. If you trade more, then you might have a chance. According to the contest rules, Binary Cent awards 20 winners per week from a prize fund of $20,000. Yet, when looking at the past contest leaderboard from the last week, it looks like they awarded traders less than $2500. I’m not sure if it’s always like this, but they should certainly live up to the prizes that they are guaranteeing traders. Also, I notice that the fifth-place prize was an iPhone 10, and the fourth-place price was $200, which is quite odd because the iPhone 10 is worth much more than $200. If you aren’t with BinaryCent, then check whichever broker you’re with, whether that’s Nadex, or OptionField to see if you qualify for their contest as well. If you are an active trader, and you are utilizing the BinaryCent platform, then you should definitely take advantage of their contests, and see if there’s any way for you to motivate yourself to win more in the binary options market. Thanks for checking out my latest article, and let me know if you’ve anything you would like to add.